Our superior reproduction 17th century full suit of plate Armour boasts a basinet style helm and smooth plates, utilizing the artistry of both great armour centers and is crafted in the styling tradition of those master craftsmen who created the originals for kings and knights throughout Europe. See the difference between this suit of armour from Italy and others made elsewhere, there is no comparison. 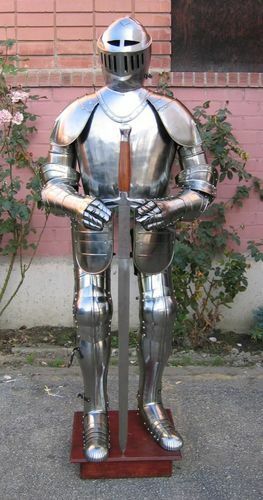 This Life size and wearable articulated Suit of Armour is made of steel and stands about 6-1/2 feet high to top of helm .